Enjoying my business tips here or on Twitter https://twitter.com/buildbizness? 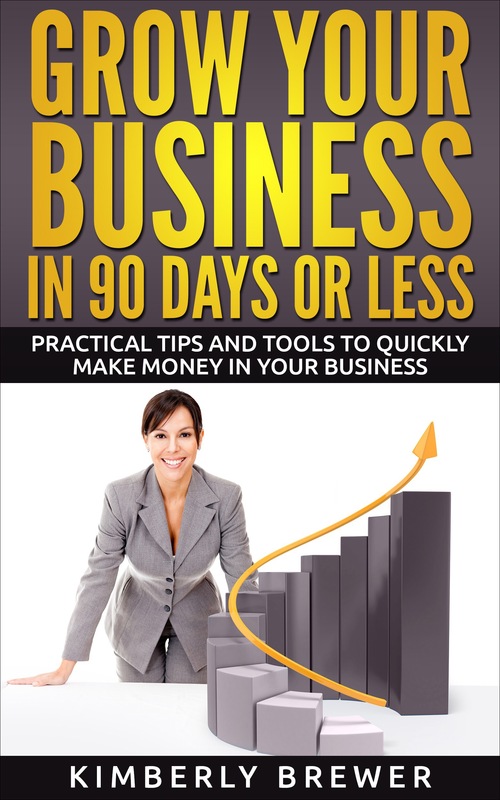 Then be on the look out for my ebook “Grow Your Business in 90 Days or Less”. The book will be full of step-by-step plans to build your business fast! Not just a “how to” book, but a comprehensive resource with many forms, documents and plans that have personally helped me build a 5-figure per month income within months! Sign up on my blog to reserve your “FREE” copy. For now, tell me what you think of the cover (by subscribing to my blog) and be entered to win a $25 American Expeess Gift card. Sign up for your *** FREE*** introductory copy! First 50 people to sign up for my blog receives a FREE copy. Coming SOON!!!! The opening statement will set the caller apart from the other representatives calling into the business. It is designed to get the gatekeeper to forward your call to the decision maker. Gatekeepers are trained to perform traffic control, switchboard traffic, that is! Their goal is to minimize what they view as interruptions. With that, they are very important people within the organization and should be treated kindly and with respect. With that, often it is necessary to work with them and respond in an unaggressive manner. The 30 second pitch should address 3 problems/pain points the organization is having and how your product, service or meeting with you can address them. Your pitch may also identify 3 benefits to working with your organization and/or purchasing your product or service. The attention question providers a question to utilize when the decision maker gets on the phone. This gets the decision maker listening to you. Questions cause people to stop, think and process as they are prompted to exchange in a meaningful way. ABC Always Be Closing, a mantra of sales. Once you’ve done this great work….ASK FOR THE BUSINESS! Visualization– To visualize is to form a mental picture or imagine. It is especially useful when cold calling or selling for new business. Imagine yourself getting past the gatekeeper, talking to the decision maker and making the sale. Visualization helps build confidence; both in the process and achieving your goals. Prior to picking up the phone to make your calls or walking into the client’s office, take 5 minutes to visualize. Take the Least Obvious Path– When making cold calls over the phone, try calling during off-peak hours (particularly if you have the decision maker’s direct extension or office number). Often times decision makers get into the office before business hours i.e. 7:30 am and stay well after 5pm. I reached a hospital CEO by calling after 6pm. Consequently, I was awarded a meeting and ultimately a contract. Another great way to cold call unlike the rest of the pack is to attend events in which your decision maker may be presenting or attending. Carefully listen to his speech and create a perfect introduction that utilizes the information you’ve learned, “Dr. Johnson your position on the new drugs targeting Hypoxia Response in Tumors, is provoking. I would love to understand…” Uniquely positioning yourself, creates a stand-out relationship and reduces barriers that can sometimes be raised in a cold calling situation. Most people like to help and give advice, so find the sweet spot with your target. Learning more about your industry and breaking the ice creates a dual-win. Utilize the VITO Method– Selling to VITO (Very Important Top Officer) by Anthony Parinello was a very popular selling strategy in the mid-nineties. Many of the principles are wildly effective today. Creating a well scripted sales letter to send to your VIP target that speaks to the target’s preoccupation and breaks her from it. The top of the letter presents a record-breaking headline in bold lettering that provides support for results that your product/service has been able to solve with past clients. It gets VITO’s attention and its a break from the norm. Within the body of the letter, present a tie-in paragraph that provides social proof for the claim that you make in the heading. Add benefit bullets in bold that explain what your product or service will do for the target. the ending paragraph should be a call to action; perhaps inviting lower level decision makers into the introduction. A post script paragraph is REALLY important and will almost always be read second only to the headline. You’ll put the precise day, date, and time that you’ll be calling VITO in this postscript, and you’ll include the name of VITO’s private assistant. Lastly, BUT MOST IMPORTANTLY you will write a handwritten note and you will attach this to the back (not the front) of your correspondence. It’s a note to VITO’s private assistant. You know he or she is going to be opening up all of VITO’s mail and reading this, correct? Social Media for Warm introductions- In the wonderful word of social media, cold calling is not so cold anymore. Utilize groups and introduction requests from your Linkedin network to provide introductions to your decision maker. Write thought-provoking post, comments and blogs (such as this one) to create expertise and brand recognition in your field. ALWAYS be responsible with social media. Appeal to the Decision Maker’s interests- Most every industry is full of professionals looking to sell their product or service. Take a different approach. Find your way to the top, by-passing everyone who is taking the stairs. Find out about your decision maker. Understand her interests. Is she a supporter of the American Cancer Society? Clip articles of interest about efforts within this group and mail or drop of the article with your business card before making a telephone introduction. Be sure to reference the article in your intro. Cold calling is really about creativity, strategy and problem solving. Use these 5 steps to cold call like a pro and win more client meetings and ultimately close more sales. Could Your Business Be Failing Due to Branding? Enter your email address to follow this blog and receive a free copy of my "Grow Your Business Sales Kit"